Disclosure: Bazooka Candy Brands sent me Bazooka Joe Bubble Gum to try for free in exchange for promotion of news and hosting of giveaway. All views shared are mine and mine alone. So, what would you do if you were celebrating a milestone like 60 years? Well, Bazooka Joe is doing it right with a makeover of sorts. Read on to learn more, as well as for a chance to win a Bazooka Joe Bubble Gum Prize pack for yourself. "Bazooka Joe, the 60-year old bubble gum chewing American Icon, is getting a makeover courtesy of some of the most talented illustrators across the globe and his devoted fans! Bazooka Candy Brands, a division of Topps, has tapped four top artists who have worked with some of the biggest studios in the world, including DreamWorks Animation and Nickelodeon Animation Studios, to help develop potential new looks for Bazooka Joe. Designs will be shared weekly via bazookajoe.com, where fans will be able to weigh in and vote for their favorite. Additionally, fans that visit the site can also enter for a chance to win one-of-a-kind Joe branded gear such as gaming consoles, skate decks and more using codes found in their Bazooka wrappers or by sending a self-address stamped envelope to a designated address. The promotion closes May 31st. The re-imagined Bazooka Joe will be unveiled in June - with new comics, featuring the new Joe and new jokes, to follow later this year. To assist with Bazooka Joe’s refresh, Bazooka Candy Brands is working with a diverse group of impressive illustrators-- Benjamin Balistreri (How to Train Your Dragon), Robert Lilly (Nickelodeon Animation Studios), Ben Reynolds (mobile Games for Ghostbusters and Monster Pet Shop) and Victor Instrasomnbat (Clockwork Animation) who will sketch potential new looks for Bazooka Joe. Each of the artists, who were selected for their talent and their Bazooka Joe fandom, have been sketching several exciting versions that introduce Bazooka Joe to a new generation while capturing his fun and energetic personality. The search for the Bazooka Joe’s new look is supported by a national broadcast campaign that launched last month, digital promotion, and social promotion. Bazooka Bubble Gum is currently available at retailers nationwide. Bazooka Bubble Gum is part of Bazooka Candy Brands popular confectionery portfolio that includes Ring Pop®, Ring Pop® Gummies, Ring Pop® Sours, Juicy Drop™ Gummies, Juicy Drop™ Taffy, Juicy Drop® Pop, and Baby Bottle Pop®. 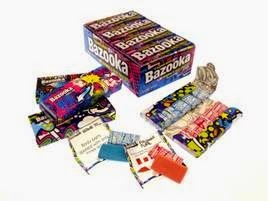 For more information about Bazooka Bubble Gum visit Facebook , Twitter, Instagram, or BazookaJoe.com. What better way to relive your childhood and celebrate Bazooka Joe's 60th birthday than with a fun giveaway. And, thanks to the kind folks at Bazooka Candy Brands, one lucky reader will win a Bazooka Joe Bubble Gum Prize pack for themselves or to share with family and friends. To enter, please complete the entries on the Rafflecopter form below. Good luck! Founded in 1938, The Topps Company, Inc. is the preeminent creator and brand marketer of physical and digital sports cards, entertainment cards and collectibles, and distinctive confectionery products. Topps' leading sports and entertainment products include Major League Baseball, National Football League, Major League Soccer, UEFA Champions League, English Premier League, Bundesliga, Indian Premier League, Star Wars, WWE, UFC, Wacky Packages, Garbage Pail Kids, Mars Attacks and other trading cards, sticker album collections and collectibles. Topps’ app portfolio, including Topps BUNT®, Topps HUDDLE®, TOPPS KICK® and Topps® Star WarsSM: Card Trader, has been a hit with millions of fans around the world. Topps’ confectionery brands include Ring Pop®, Push Pop®, Baby Bottle Pop®, Juicy Drop ® Pop and Bazooka® bubble gum. Topps was acquired by Michael Eisner’s Tornante Company and Madison Dearborn Partners in October 2007. For additional information, visit Topps.com and Candymania.com.